Throughout her career, British actress Vivien Leigh appeared in 20 films, acted in countless theater productions, and amassed a devoted fan base throughout the world that is still active today, over 40 years after her death. 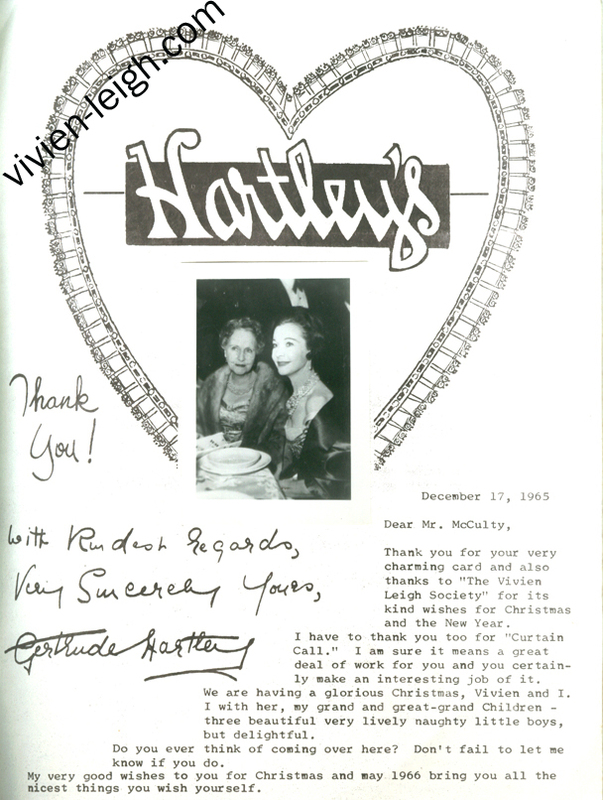 In all of her dealings with fans and admirers, Vivien showed the utmost grace and class, replying to countless letters and autograph requests. 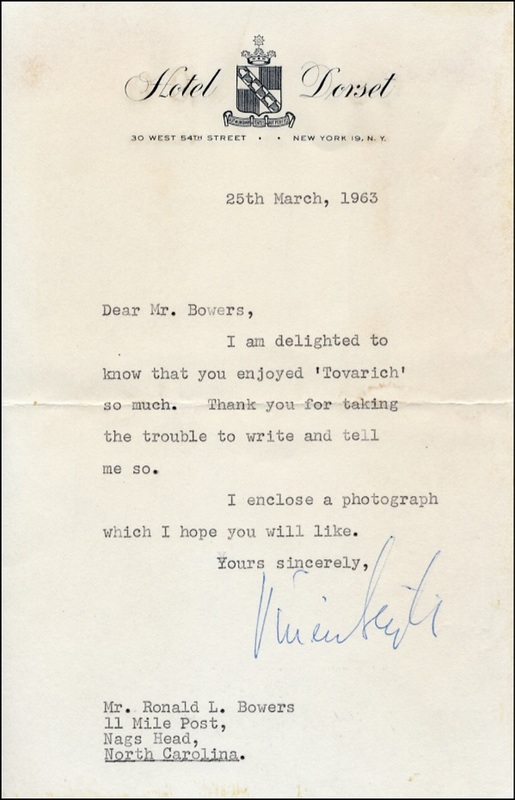 Here are some examples of the letters Vivien wrote in response to her fans. 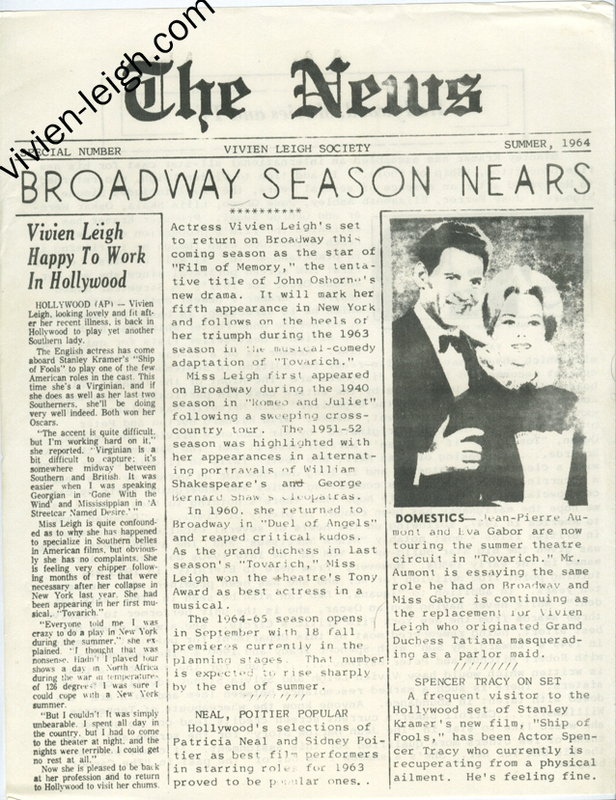 Interaction and correspondence with her followers reached its high point in April of 1963, during Leigh’s run on Broadway in Tovarich, with the founding of the Vivien Leigh Society. With a basic $2.50 annual membership fee, one would receive “2 large journals a year, news bulletins, membership photo-cards, and autographed photo’s from Ms. Leigh from time to time when Ms. Leigh can do this for us in addition to access to the library and photograph order department maintained by the VL Society.” The Society was the second organized, membership-driven fan base for Vivien, the first had been active from 1948-1953. Over the past year, I have had the opportunity of meeting and getting to know an avid Vivien Leigh fan and active member of the Vivien Leigh Society, Robert Rosterman. 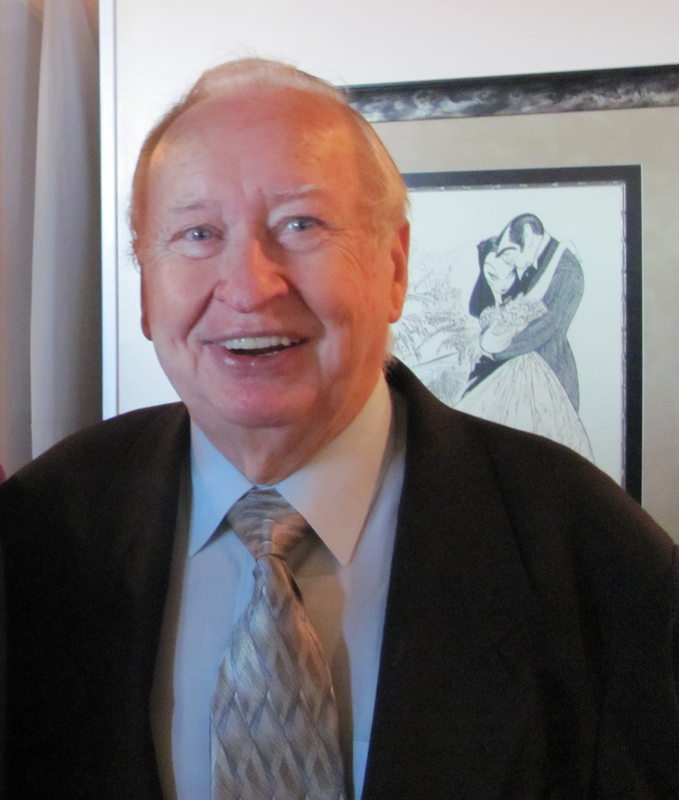 I first met Mr. Rosterman in October of 2010 at the Marietta Gone With the Wind Museum. He was a wonderful man with amazing stories to share. 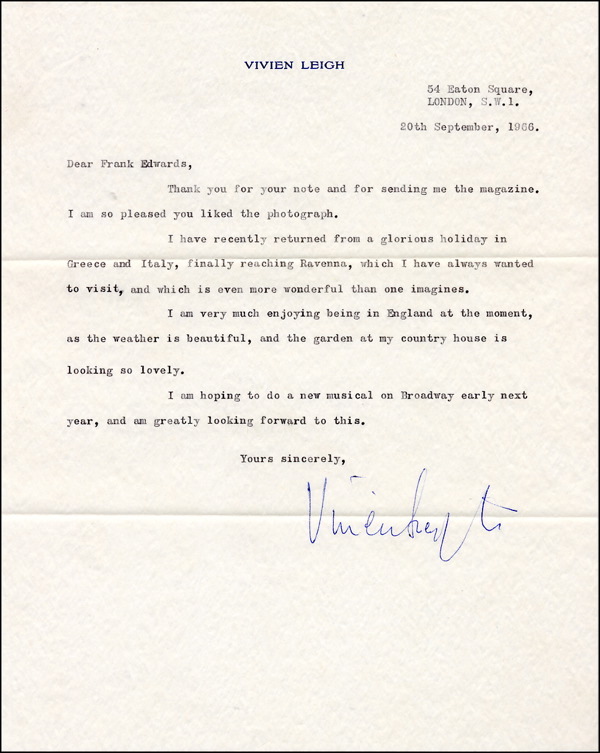 Throughout his life he corresponded with Vivien Leigh, via mail and telegram. He shared stories of Vivien sending him a Christmas telegram and the joy he experienced when getting letters from her in the mail. Based in Chicago, Mr. Rosterman attended multiple performances of Duel of Angels. After the show one night, he waited outside of the exit used by the performers and had the opportunity to meet Ms. Leigh. On another occasion they met again at a bar in Chicago, he offered to buy her a drink and to his delight, she said yes! They both had a “Scarlett O’hara Cocktail,” and he shared with her his yearly tradition of drinking a “Scarlett O’Hara” on December 15th, the anniversary of the premier of Gone With the Wind. He said that she was completely unaware of the drink’s existence and didn’t really care for it, claiming that it was “too sweet”. He also met her backstage in New York after a performance of Tovarich, and she recognized him by name from their previous encounters. 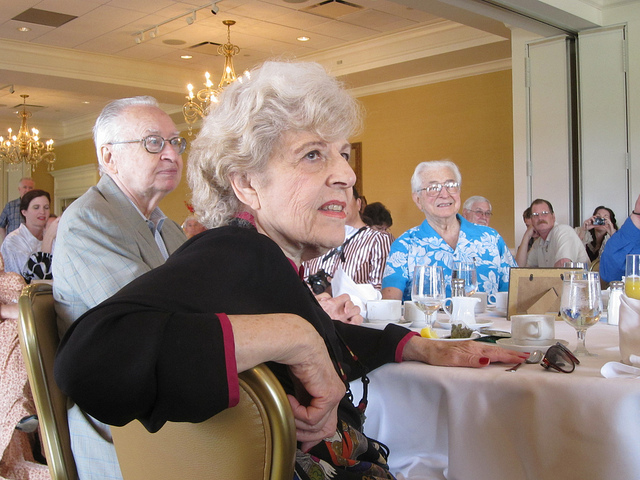 Robert Rosterman sitting with Vivien Leigh biographer Anne Edwards in Marietta, GA in June of 2011. Photo courtesy of the City of Marietta. Robert Rosterman at the Marietta Gone With the Wind Museum in October of 2011.